There is growing evidence to suggest that winters will continue getting colder. Homeowners are looking for new ways to reduce heat loss to control their escalating heating bills. Shutters provide an excellent way to improve energy efficiency in your home. When closed, shutters have been shown to reduce heat loss through a window by more than 50%, according to a recent study by The English Heritage. We have a number of effective solutions to help reduce your heating costs. We are all looking for ways to conserve energy and reduce heat loss. Window coverings can reduce energy loss through the windows, lower heating bills and improve home comfort. 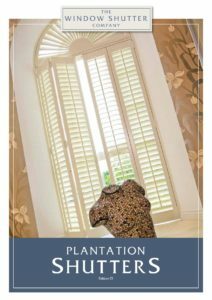 Interior plantation shutters are one of the most energy efficient window dressings that you can use. They will help reduce heat loss in the winter months and reduce heat gain in the summer. Shutters are excellent insulators and will trap the cold air between your shutter and the window. About 30% of a home’s heating energy is lost through windows, according to government agency Energy.Gov. Most types of window treatments will result in energy savings, but the exact savings will depend on the type of attachment, the season, the climate, and how the attachment is used. The English Heritage, who support national and global efforts to reduce energy consumption, carried out a study, as mentioned earlier, into the thermal performance of timber sash windows and this produced some interesting results in relation to interior plantation-style shutters. With many original Georgian and Victorian windows still in place, they funded research at Glasgow Caledonian University (GCU) in conjunction with Historic Scotland. They provided GCU with a traditional double-hung vertical sliding sash window in poor condition. As part of their research, they looked at the effects of adding curtains, blinds or shutters to the window and the effects this had. Do shutters prevent heat loss? Window shutters are an excellent way to prevent heat loss. When the shutter panels and louvres are closed, they can reduce heat loss through a window by more than 50%. Combined with secondary glazing, this can exceed 62%. You could also combine shutters with curtains and see even greater insulating properties. We wrote an article recently about whether we can install our shutters to windows with secondary glazing. Do shutters keep heat in? 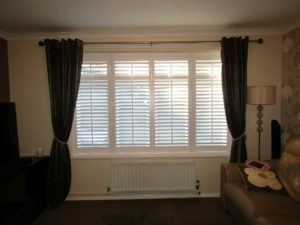 Shutters are superb way of effectively adding a layer of insulation to your windows. When they are fully closed, they will keep the warm air in your room and block out any of those money draining draughts. 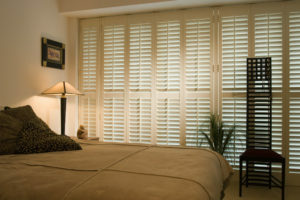 The solid material of shutters will provide a more effective solution than blinds or curtains. It is important to note that the study was using solid, rather than louvered shutters. Solid shutters are in keeping with Georgian and Victorian properties. However, due to the lack of any louvres, they do lack versatility and can only be fully open or fully closed. That said, if we assumed that the heat loss reduction of a louvered shutter is somewhere between that of a honeycomb blind and a solid shutter, you would still be looking at greater than 50% reduction in heat loss, when they are closed. 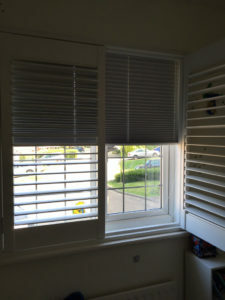 Due to the nature of a shutter, whether louvered or solid, you are going to see better conservation properties than a blind as the panels of a shutter have a frame surrounding them that is fixed into the window reveal. This significantly reduces cold air entering the room. The British Blind and Shutter Association (BBSA) is the UK trade association for shutters, blinds and awnings. They have a fantastic website which provides, amongst other things, impartial advice about window treatments. When closed, the traditional solid shutter will arguably be the best window covering you can install to reduce heat loss. By having the additional layer, you are providing extra insulation for your home. This is a similar solution to the one above, but this time with a curtain in front of the shutter, rather than a blind behind. 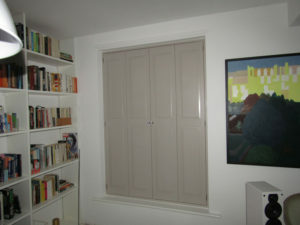 Full Height shutters (pictured) cover the whole of the window, as opposed to Café Style, which leave half of your window exposed and therefore not offer you the same level of insulation. We are proud members of the BBSA, along with The Guild of Mastercraftsmen and Checkatrade. We are a well established family run business based in Haywards Heath, West Sussex and we cover the South East of England. We have fitted shutters to virtually every type of window imaginable and will be happy to chat through your requirements with you. If you would like to get a guide price for shutters to help insulate your home, please send your window dimensions via email to or use our Contact form. Rest assured, we will always follow this up with a free home design visit if you wish to pursue further, where we will talk you through design and product options, and where we will do a final measure for order.